1. Noah and Rosie are both continuing to compete in cross country. Noah achieved a PR last weekend of 18:13 in the 5K and Rosie's would like to break into the 9 minutes range for the 1 1/2 mile - if possible tomorrow!! 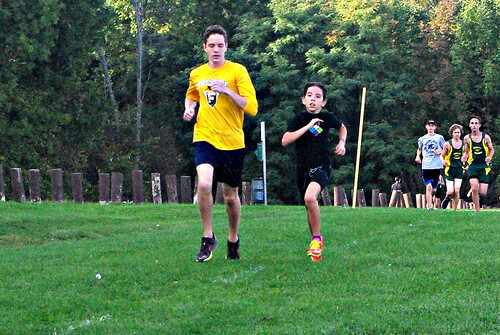 But on Tuesday, there was a special meet where both Noah and Rosie had a chance to run. 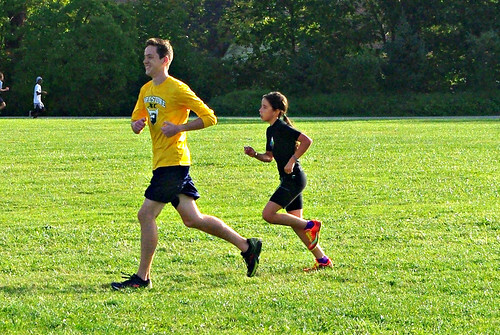 It was a 2 mile race for the JV team and middle schoolers (7th and 8th grade) but Rosie was invited to run too. 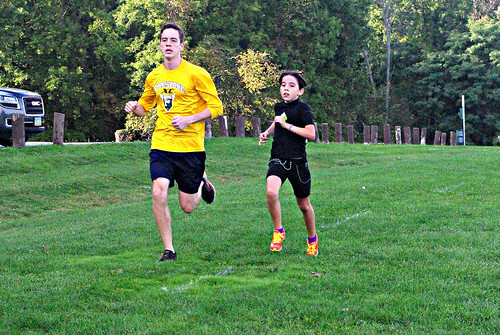 As a Varsity Runner - Noah didn't have to run at all, but he ran with his sister and even dared her to a sprint to the finish line! It was just one of those times that I'm sure I'll hold in my heart for a long, long time. I was able to get amazing pictures of my two favorite runners. 2. I love and hate Facebook. I love that I am able to connect to my daughter-in-law on a regular basis and I think she and I are getting to know each other better that way. It's not the same as having her here, but it's a good second and certainly better than my grandmother had back in the 1950s. I HATE Facebook for all of the political crap that's posted there with regularity. I literally have friends that can only spew this garbage each and every day and frankly, I just don't have time for it any more. I keep uplifting and family stuff on my personal page, but anything controversial I post only on my blog page on facebook. That way, I am keeping those things separately. Here's the thing - I will never de-friend anyone - ever. If you're my friend on Facebook, it's because I value you and we shared a special time or place in my life that I still appreciate. But that doesn't mean I have to read all your stuff every day - so I won't. I want to hear about your family, and your activities, and pray with you when you're sick or sad, and celebrate when your children or grandbabies do something cute. So from time to time, I'll peak at your wall and see what's going on. If you want me to see something and you're afraid I'll miss it, you better send it to me in an instant message. Other than that, I'm done. 3. So, I've been having this weird thing with my left arm. I noticed this summer that my thumb shook and sometimes my middle finger. One day after using the hedge clippers to cut a big bush back, my entire hand shook so bad I couldn't handle a cup of tea. Thankfully, that got better quickly, but I also noticed that my arm sort of felt tired - all the time. Of course I googled symptoms of a heart attack, but this didn't seem to be anything like that. Then last week, I was taking my cranberry supplement and Biotin and I came upon a bottle of Vitamin D I had bought for Noah. I decided that I should probably take one of those too since I wasn't as outdoors as much - and within the hour I noticed my arm felt much better. So I've been taking that all week and the symptoms are 90% better? I think that's an odd symptom for vitamin D deficiency. I'm also going to take my sister's advice and cut back on the Diet Coke, and see if that helps. 4. 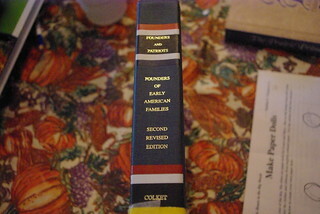 Ancestry.com let me know that information about my 10th great grandfather, Richard Sikes (or Sykes) was available in a book called Founders of Early American Families! And my library had a copy. So I got it and took some pictures. 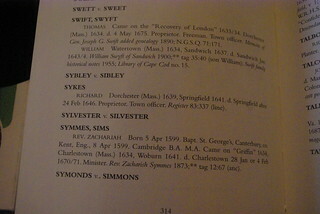 I didn't get much more information, but it was very neat to know that somewhere in history there is indeed a record of a man who came to Massachusetts, and had a daughter who had a daughter and on and on until there was my mom, and then me and my sister. 5. I mentioned a few weeks ago that Don, a special relative of mine, had died. Long-time readers might remember my Aunt Opal. Don was Aunt Opal's son-in-law, married to Aunt Opal's daughter Janet. So if you're trying to figure this out at home, Janet is my mother's first cousin. 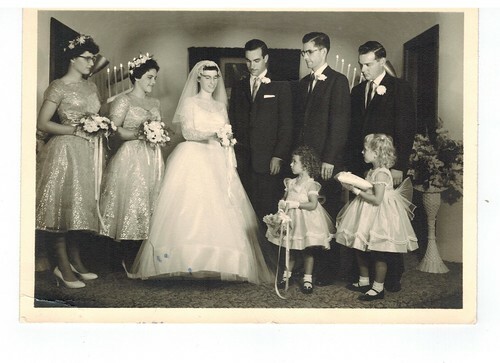 This week, another one of those first cousins, Marie, sent me a picture of Don and Janet's wedding and I was thrilled to see it. I understand that the bridesmaid's dresses were a golden color and that for this photograph, it was the bride's wish that they all look at her bouquet. I'm sure there was something special about that too, but I don't know for sure. Marie also shared with me that the next day, with her daughter on her honeymoon, Aunt Opal gave her a big hug with some happy/sad tears at the idea of daughter being married and away. As a recent Mother-of-the... I totally get that. I'm so grateful to have that information and this picture. 6. Speaking of wedding pictures, I just got access to hundred's of Calvin's wedding pictures. My daughter-in-law shared 300 of the professional shots with me, and a dear friend sent me some of the great pictures he took. I spent most of Thursday looking at all of these, making some order out of them and remembering that day that wasn't really all that long ago. 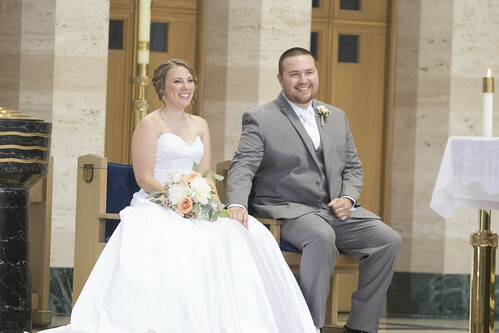 This was one of my favorites, because it just shows how happy Calvin and Sarah were on their day! They say that something always goes wrong on the wedding day, but for those two - everything was perfect. 7. October is SIDS, Pregnancy and Infant Loss Awareness Month. I am already too acutely aware of it. For starters, Raphael's birthday is November 1 - so that always looms in the fall along with All Saints and All Souls day. Yet life keeps moving me forward from the sadness of that day 13 years ago now. 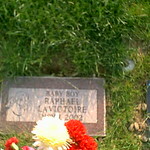 This week, a friend of mine had a little boy and named him Raphael. And little Miss C has her birthday at the end of October and that calls for a celebration. And let me tell you, celebrating a baby's birthday with cake and toys and balloons, beats celebrating a baby's birthday in the cemetery any time! #5 I love that old wedding picture! And Facebook; such a love hate relationship. I wind up unfollowing (but not unfriending) many people just to keep my feed less stressful. With an election year coming up, I'm sure I'll have to hide even some of my closest friends to keep my blood pressure down. Thanks for dropping by Kelly! I have had to hide dear friend's feeds because of PP ad campaign. I am sad that she turned so far left.